He is the world-wide spiritual leader of the Bön religion of Tibet. He was born in Amdo, in the far eastern region of Tibet, in 1927 and became a monk at the age of eight, at Kyong Tsang monastery, near where he was born. 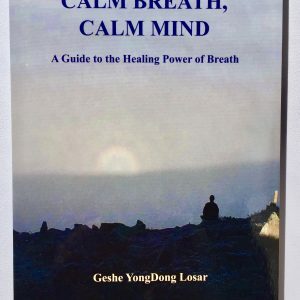 When he was sixteen he entered the Dialectic School at the monastery, and after eight years of study took his Geshe degree, specializing in Tibetan medicine, astronomy and astrology. Soon after, at the age of twenty-six, he traveled to Gyalrong in eastern Tibet, where he printed the Bönpo scriptures, a set of over one hundred books called the Kangyur, from wood blocks kept by the king of Trochen Gyalpo, one of the eighteen kingdoms of Gyalrong. He then brought the published Kangyur back to Kyong Tsang Monastery. Then he traveled to central Tibet in Tsang province, for further studies at the Bön monasteries of Yung Drung Ling, sMenri and Khana. Later he went to Drepung monastery in Lhasa to do research and practice, staying five years until the 1959 uprising. At the time of the conflict against the Chinese in 1959 he fled on foot from Tibet to Mustang, on the border of Tibet and Nepal, then to Pokhara, Nepal, and then to India. While in India he got word that the Abbot of Yungduung Ling monastery and many Bönpo lamas had reached the Bön monastery of Samling, a very old and important monastery in the Dolpo region of Nepal, and he went to join them. After some time they all traveled down to the valleys of Nepal. Later he went back to Samling monastery in order to borrow books so that they might be republished. The books of the Bönpo are very important to practice and study, and when the lamas had fled Tibet the books had to be left behind, and were later destroyed during the Cultural Revolution. The only copies of many texts were often in remote outlying areas, so it was important that the books be republished. While at Samling he met Dr. David Snellgrove, a researcher of Oriental and African studies from London University, who advised him where he could best print the texts. Based on this advice he and the Abbot of Yung Drung Ling took the books to New Delhi where he worked with Samten Gyaltson Karmay and Lopon Tenzin Namdak to republish the texts. Later Dr. Snellgrove invited them to come to England with him under the sponsorship of the Rockefeller Foundation. There they taught Tibetan culture and religion and studied the ways of the West. Sangye Tenzin Jong Dong, as he was then called, stayed in England for three years during which he lived and studied with Benedictine, Cistercian and other Christian monastic orders, and traveled to Rome to meet Pope Paul II. In 1964 he returned to India to found a school funded by sponsors in England. His Holiness the Dalai Lama asked him to start the school in Massori, India and he staffed it with volunteer teachers from the West. 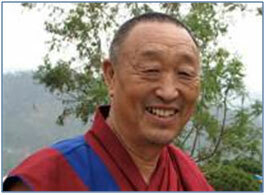 He remained as head of the school for three years, teaching Tibetan grammar and history. Each month he sent his salary, three hundred rupees a month, to the refugee Bönpo lamas living in Manali, India for them to buy food. He also helped create a meditation center in Manali for the lamas and monks. Later the school that he had founded was moved to the south of India, where it became the first permanent Tibetan settlement in the region. In 1965 Lopon Tenzin Namdak returned to India and with help of the Catholic Relief Service purchased land in Himachal Pradesh, India to found Dolanji, the home for the Tibetan Bönpo refugee community. In 1966 Geshe Sangye Tenzin Jong Dong traveled to the University of Oslo, Norway at the invitation of Per Kvaerne, where he taught Tibetan history and religion for two years. On March 15, 1968 while in Norway he received a telegram from India which stated that the Protectors of Bön had selected him the 33rd Abbot of sMenri, and spiritual leader of the Bönpos. The Abbot of Yung Drung Ling, Lopon Sangye Tenzin, Lopon Tenzin Namdak, and about ten other Bönpo Geshes had prayed in the Drup Khang, or Protector’s temple, for fourteen days. The guardians then selected Geshe Sangye Tenzin Jong Dong from a group of ten Geshe monks eligible to be the new Abbot through a divination process. 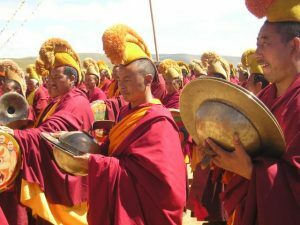 Each of the Geshe’s names were written on a small piece of paper, each of which was enclosed in a small ball of ceremonial dough made from barley four and holy medicine, and these balls were placed in a vase. After prayer and rituals lasting two weeks, the Abbot of Yung Drung Ling shook the vase and three names came out, one by one, onto a special Mandala. All of the other names were removed from the vase and the three put back in, and the process began again. This time, two names were shaken out, one after the other. The first held the name of who was to be the new Abbot, and this ball was used in initiation and rituals, and then opened in front of all the people present, who promised to honor him as the one true Abbot. The second man chosen would hold a very important position with the Bönpos as a lama and teacher. 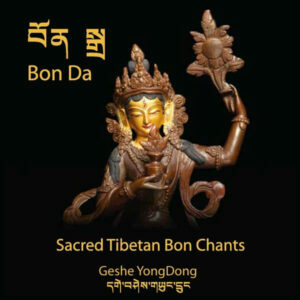 On the night of March 14 in Norway, Geshe Sangye Tenzin Jong Dong had a dream that he and the man who was the second name to emerge from the vase were on the top of a temple, each holding a conch shell, used in the monastery to make music at special times. It became very windy and the second man was unable to hold his conch, and it blew out of his hand and broke on the ground below. Sangye Tenzin Jong Dong was able to keep his conch safe in his hand and play, despite the terrible storm. The next morning the telegram came inviting him to become the new Abbot. So he returned to India and assumed his duties as the spiritual leader of the Bönpo at a very crucial time in their long history. Their world had been destroyed and their lineage almost lost, but he had to lead them to a new beginning. It would take a very strong and compassionate man to help them build new monasteries and schools, and to save their culture and religion in strange and new surroundings. Many lamas came from Tibet, Nepal and India to give him their initiations and teachings, and for over one year he intensively trained and practiced for his role as Abbot, the leader who would guide the Bönpo and hold all the teaching lineages. Slowly over time he was able to build a new sMenri monastery in Dolanji, and after that a Bön Dialectic School, which awards Geshe degrees, with certification recognized by H. H. the Dalai Lama. He also founded an orphanage at the monastery for Bön children, called the Bön Children’s Welfare Center.